Now that I have older kids, some of our Easter traditions have had to grow up with them. Here are some fun Easter Ideas for Teens to get them involved and having a good time! When your kids become teenagers, they just weren’t into the same things they were when they were younger. They aren’t really into dying Easter eggs anymore, and I don’t even try to get my boys to wear the bunny ears headband that I placed on them as toddlers. So, I’ve had to search a bit for ideas that they will enjoy. And I’m going to share some of the fun things I have found!. Whether you hide eggs in your home or in the yard, you can hide golden eggs for an extra ounce of fun. Golden eggs have cash, coupons or even gift cards inside. The coupons can be anything from a special outing with parents, a day free of chores, or maybe some extra screen time. Whatever your older kids will enjoy! There comes a time in every child’s life when the standard easter egg hunt gets boring. Yes, it’s an adventure for kids aged 5 and under, but when you can see the eggs in clear daylight, the adventure is gone for the big kids. Enter the flashlight Easter egg hunt for teenagers. We’ve had so much fun with a group full of teens hunting in the dark. It’s actually challenging and fun to find eggs in obscure places. This is a tradition we have been doing in our neighborhood for years, and kids and parents of all ages love it. Have you ever seen the cascarones? They are confetti filled eggs. You can get a bunch of those and have a confetti egg fight. If you’re going to have a big group, have each bring their own dozen to play with. Make sure you have your camera because the confetti eggs makes fun pictures! 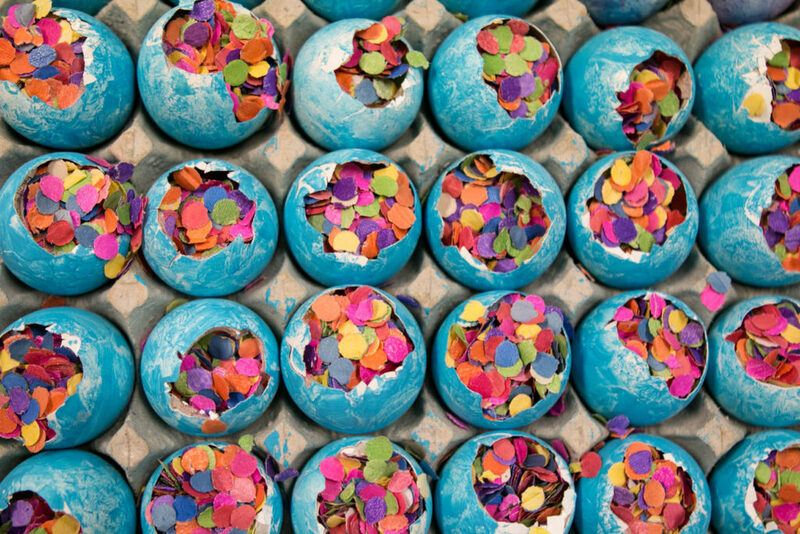 While they take just a few seconds to crack over peoples heads, cascarones are actually hours of work. (Reminds me of water balloons). If you don’t have your teens helping you in the kitchen, it’s TIME! Making a big holiday meal can be stressful, teens are opinionated and like to eat, so include them in the menu planning, table decorations, and the cooking. Teens can be a HUGE help, and it’s also a great opportunity to remind them that they aren’t entitled to have mom slave away and present them with a delicious meal. For years, I’ve had a hard time knowing what to do for easter basket ideas. Gone are the day I can throw in a bunny stuffed animal. And for a while, my runner boys didn’t want anything to do with candy….what??? So I’ve moved to simplicity, which I’ve found I’m enjoying anyway. I saw my friend @ThrivingMotherhood post on Instagram recently that she gives her kids hats with a few things inside instead of Easter baskets. I kinda LOVED that idea! 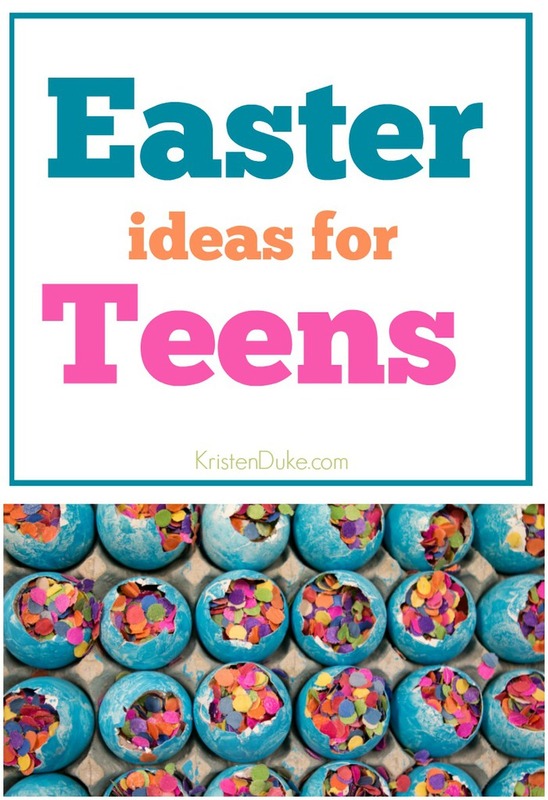 Whether it’s a hat or basket, below are a few items that would be fun Easter ideas for teens! Here is a little visual of some of those Easter ideas for teens that I found on Amazon. Just so you know, if you purchase through my Amazon links, it is not additional for you, but a portion of your sale comes back to me as an affiliate for Amazon. Hope these Easter ideas for teens help you think outside of the box a little for the big kids in your life.